Photo of the Week.. The Moon glows softly at mid- eclipse, in full totality, the night of October 27, 2004. 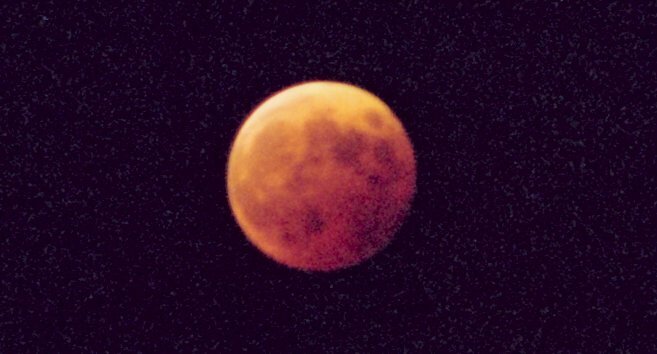 Light is refracted and scattered into the Earth's shadow by our atmosphere, allowing the Moon to be seen in eclipse and also causing the deep red color (for the same reason that sunsets are reddish). The Moon passed a bit above the center of the Earth's shadow, which causes the gradation in brightness from bottom to top. The lunar maria, lava-filled impact basins, are readily visible. Astronomy news for the week starting Friday, October 29, 2004. The Moon spends the entire week in its waning crescent phase, not reaching new until next Friday, November 12. As it goes, it hits and occults (covers over) three planets in a row: Jupiter, Venus, and Mars, respectively on Tuesday the 9th, again on Tuesday the 9th, and on Wednesday, the 10th. Unfortunately for the Americas, none of the events occur at night at locations where we can see them. Jupiter's occultation at least is "visible" in the daytime in the central and eastern US and Canada, but only with a decent telescope. At least we had last month's lunar eclipse to watch. The planets themselves of course are quite visible from late evening to the morning hours that extend into dawn. Start with Saturn, which now rises much earlier, around 9:30 PM in eastern Gemini, nicely pointed downward to by Castor and Pollux. After a long wait, Jupiter and then Venus hit the stage shortly before 4 AM, both (after last week's conjunction) still quite close together, although Jupiter is now to the west of Venus. Almost exactly as twilight begins around 5 AM, much dimmer Mars lofts itself upward above the eastern horizon. Between Mars and Venus, find Spica in Virgo, and to the left of Jupiter, Porrima (Gamma Virginis), which completes the wonderful set. The Moon will make a trio above Jupiter and Porrima the morning of Tuesday the 9th, and below Venus the morning of Wednesday, the 10th, when it will be above Spica and Mars in growing twilight. Still the planetary news rolls on. Saturn, which has now moved well into the evening, becomes stationary in its easterly voyage against the stellar background, and turns westerly, retrograde, on Monday, the 8th, as the Earth prepares to come between it and the Sun. Just three days later, on Thursday the 11th, Uranus (in southern Aquarius), the next planet out from Saturn, ceases retrograde, and begins normal easterly progression. The same day, Mercury (an evening planet) quite invisibly passes conjunction with (and to the north of) Antares. In mid-fall we see the upswing of the Zodiac from Capricornus (the "Water Goat") through Aquarius, then past the Vernal Equinox in Pisces and into Aries. Many constellations are known by small asterisms within them, Ursa Major by the Big Dipper, Cassiopeia by her "W." Aquarius -- the Water Bearer -- is best known by his Y-shaped "Water Jar" or "Urn," from which he pours his waters into the mouth of Piscis Austrinus, the Southern Fish, which is epitomized by the first magnitude star Fomalhaut, "the Fish's Mouth." Farther upstream in this "wet quarter" of watery constellations, Pisces (the Fishes) is noted by its "Circlet," which lies due south of the Great Square of Pegasus.